was in DC last Thursday briefing some people on social media. 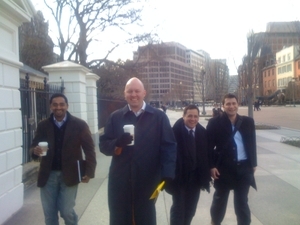 Here’s a photo of Chamath Palihapitiya (VP at Facebook), Marc Andreessen (Chairman of Ning), Michael Wolf (fmr COO of MTV Networks), and myself doing our best reservoir dogs impersonation in front of the White House. Photo was taken by Chris Alden (CEO of SixApart which owns Typepad where this blog is hosted). This entry was posted in Uncategorized on March 2, 2008 by auren.